Listicles, which are articles presented in list form, are a popular way to share information in the digital age. They’re a flexible way to present ideas, whether you’re writing a lighthearted blog post or an information-packed news article. To write an effective listicle, start by narrowing your topic and choosing the best format. Then, you can draft the body of your listicle, using popular strategies for creating good content. 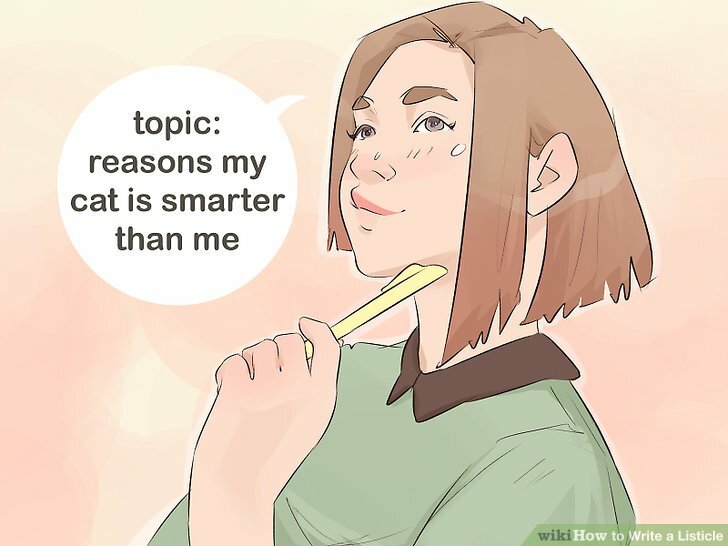 Choose a topic that interests you. Your topic can be lighthearted or serious, depending on your preference. 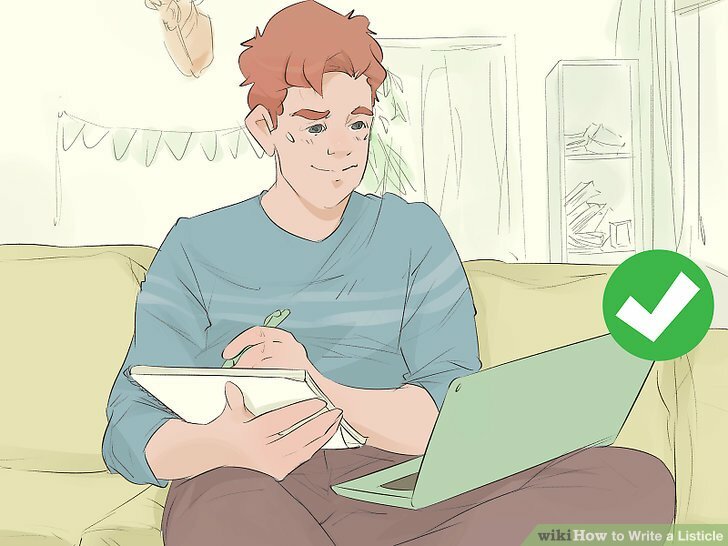 Start with a broad topic, as you can then whittle it down to a unique idea. To get your idea juices flowing, brainstorm, make a list of your interests, or make a mind map. If you’re writing for your personal blog or to fulfill an assignment, pick something you’ve always wanted to write about. If you’re writing for publication, pick a topic that fits with their typical content but hasn’t been done yet. Remember, it’s okay to play around with a popular topic, as long as you bring a unique perspective. Do an Internet search on your topic to read other writers' perspectives. This helps you create your own perspective on the topic, rather than accidentally recreating content that’s already been published. Look on popular news, lifestyle, culture, arts, and entertainment sites. 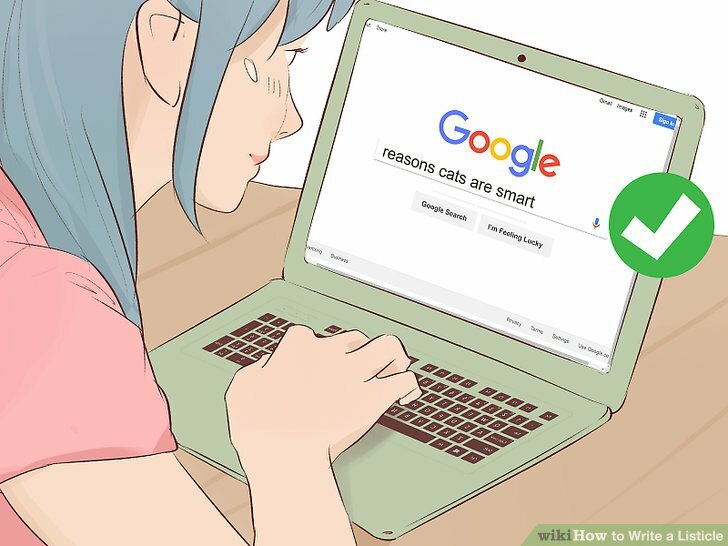 You can also do a simple Internet search. If you have a specific publication in mind, search their site. Sites you might explore include Buzzfeed, Bustle, Tiny Buddha, HelloGiggles, Mic, Cracked, and Wired. How do my prior experiences relate to this topic? What would I like to learn about this topic? How is my relationship to this topic affected by my cultural background, ethnicity, gender, ***uality, or other personal identity? Create a specific title that tells the reader exactly what to expect. Listicles don’t have titles that make the reader wonder what’s inside. Instead of trying to be clever, clearly convey the contents of your article. Avoid using a title that sounds like click-bait. For example, a good title might be “5 Things Karaoke Taught Me About Life.” On the other hand, “You Won’t Believe These 5 Things I Learned From Karaoke” sounds like click-bait. Conduct research, if necessary. You might not need research if you’re writing from personal experience. However, research can help you identify better points to back up your ideas, as well as good support for your explanatory text. If you use information from a source, cite it in your listicle either in the text or by including a link. List out your main points, keeping them short. This is the meat of your listicle, and what readers should take away from it. If your points are based of personal experience or a factual story, this process might be easy. However, it might take more brainstorming to create a long listicle. Try to find things that are unique or interesting! You should surprise your readers with at least a few things they didn’t know before they read your article. If you’re creating a long listicle, you might create a lengthy list of possible entries to narrow down later. At first, don’t worry if they fit the topic perfectly. 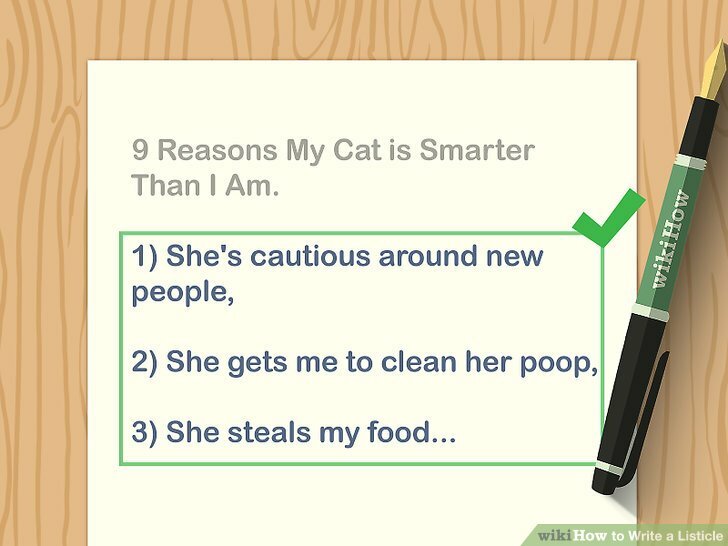 For instance, let's say you're writing a listicle called “9 Reasons My Cat is Smarter Than I Am.” You might start your list with these points: 1) She's cautious around new people, 2) She gets me to clean her ****, 3) She steals my food, etc. Provide an engaging introduction to the topic. Introduce your topic to the reader, as well as your unique perspective. Use your introduction to show the reader why you chose this topic, as well as how your list will differ from others they may have read on this topic. Your introduction can be as short as 1 paragraph, but sometimes you may need more paragraphs to set up your listicle. This depends on your purpose. A short introduction might read like this: "Living with a cat isn't always easy. Not only is my cat a messy roommate, she's also clearly in control of our household. While it might seem like a bad idea to have a cat be the boss, my cat is clearly smarter than I am. Don't believe me? Here are 9 reasons why:"
Write out your points. Keep your points short and easy to skim over. Provide the reader with enough information to understand what you’re trying to say, but don’t tell them everything if you’re further developing your point. Entice them to read the rest of your article, not just the numbered or bolded points. 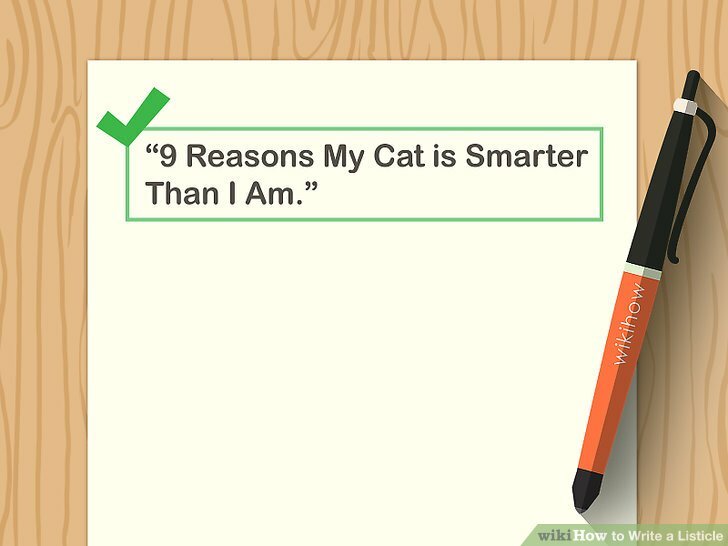 For example, you might write this point for the article “9 Reasons My Cat is Smarter Than I Am”: 1. She’s careful around new people until she gets to know them.” The reader can easily understand what the writer is trying to say, but there’s room for development, such as examples of how the writer has been taken advantage of in the past. Flesh out your points, if applicable. 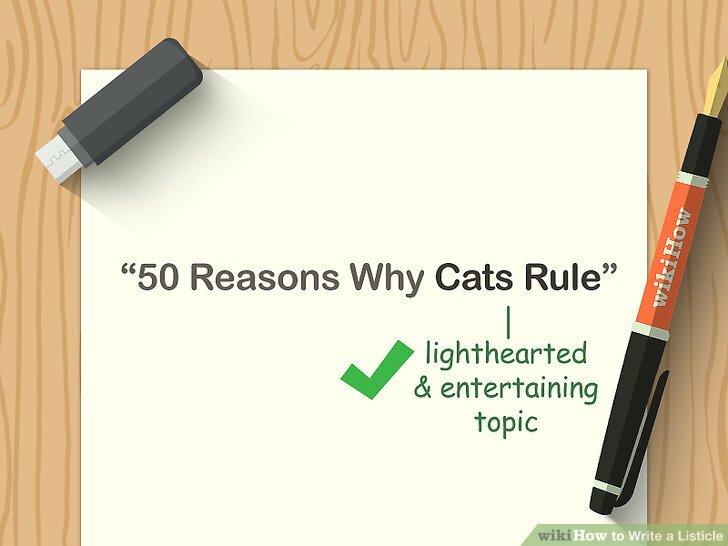 Most listicles offer at least some explanation for each of the points. This can vary from a few sentences to several paragraphs. Consider the purpose of your listicle and your chosen format when deciding how much extra information to include. Since listicles get to the point, keep your explanatory information as concise as possible. Remember, it’s okay to include just your points if that’s what you want. 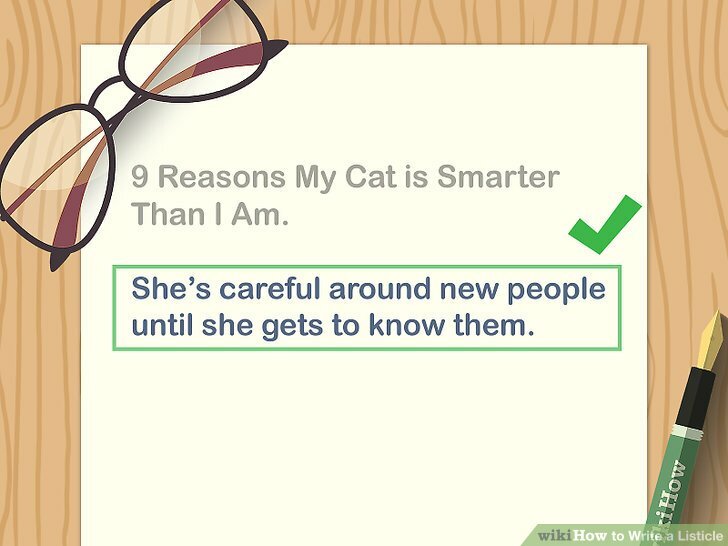 For point 1 above, you could write: "Whenever new people come over, my cat always darts under the furniture and stays there until she knows they're nice. I, on the other hand, am way too trusting. I've lost money, credit for an assignment, and my favorite jacket all because I trusted the wrong person too soon." Organize your points, if necessary. Some listicles can be in any order, so you may not need to organize the points. However, sometimes it’s necessary to create order. For example, a news article might be put in chronological order. Consider if your reader will better understand your points if they're presented in a certain order. If so, organize your points. If you do need to organize your points, put them in the most logical order, such as chronological or procedural order. You might also order your points according to importance. For example, you might decide to put the litter box point last, since it's likely that people will naturally think of it. In this case, you want to put your most creative points first so people keep reading. Add images to illustrate each entry, if you’d like. Listicles commonly contain images, such as photos or GIFs. Choose images that directly relate to your points. Make sure you use images and GIFs that you have permission to use, such as those available through Creative Commons. 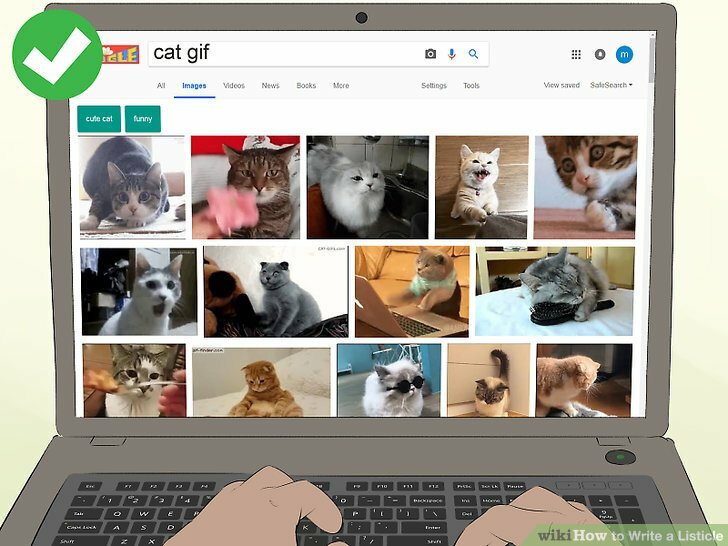 For example, you might use a photo to depict the point you’re making, or you might include a GIF to show an emotional reaction to that point. 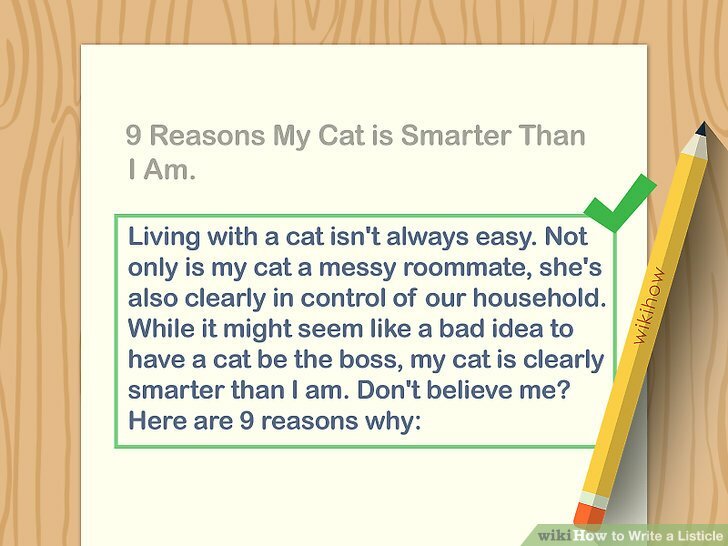 For “9 Reasons My Cat is Smarter Than I Am,” you might include GIFs of cats. For the point about trusting people, you could use a GIF of a cat running under furniture. Include a conclusion to tie your listicle together. Conclusions are often overlooked when it comes to writing listicles, but they’re still important! After your points, write a brief conclusion to summarize your ideas and leave the reader with a lasting impression. Choose a format that fits your purpose. While listicles may have a reputation for being click-bait, this often isn’t the case! Listicles can inform the reader about important topics or instruct the reader about how to do something. Because of their flexibility, they also allow writers to entertain readers. You can present your list in paragraphs or as a collection of points. Similarly, you can number your list, use bullet points, or simply bold your points. Use a combination of text and points to relate a personal experience. Some listicles explore an incident in your past and how it can help others. You might include several opening paragraphs, then a series of points, each followed by text. In some cases, you might turn a personal essay into a listicle this way. Make your points the focus when relating to a group, with little text. With some listicles, you can relate to other people who’ve shared in your experiences. These lists include common experiences shared by a particular group, such as students, Texans, cancer survivors, nurses, etc. When creating this type of listicle, you should emphasize your points, with little further explanation. You’re expecting your reader to immediately connect the dots based on their own experience. 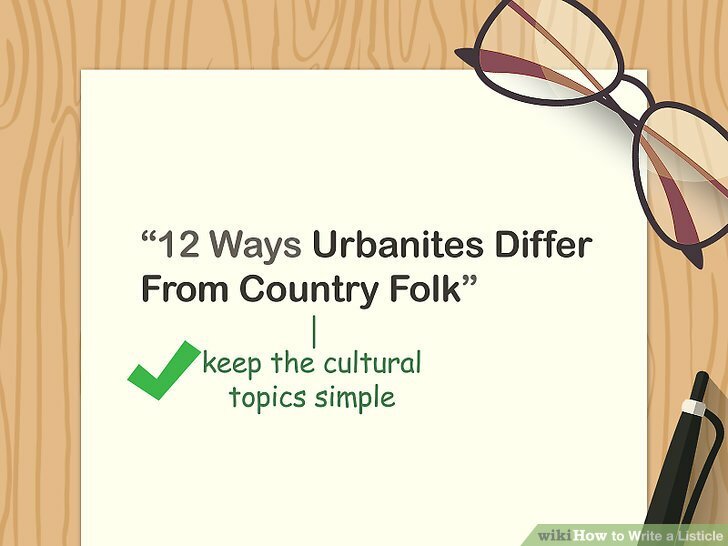 Keep it simple when presenting ideas about society. You might use your listicle to explore something you’ve learned about cultural topics. For these types of lists, you might provide a short explanation for each point, but you likely won’t go into great detail. 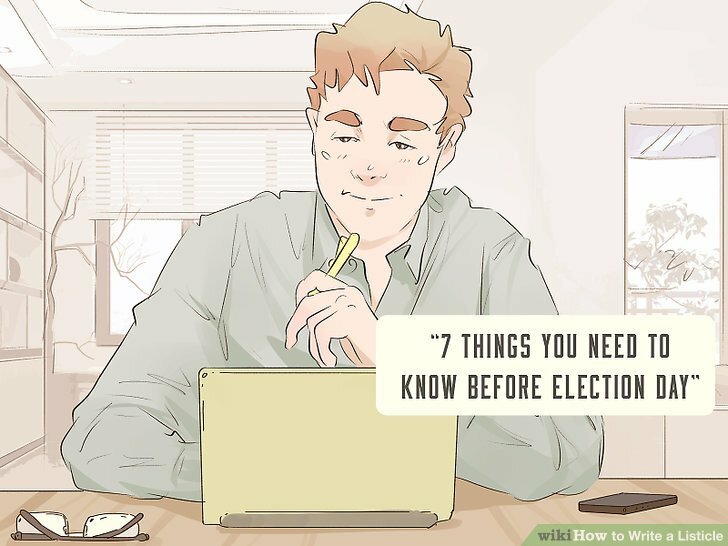 Provide several points, along with 1-2 short paragraphs of information. Provide research or reported facts in an easily digestible format. Listicles that present research or reporting contain more “meat.” Although they may be longer in some cases, this is not always true. Listicles can summarize a lot of important information, similar to an outline. On the other hand, they can also make complicated topics more approachable. Think of your listicle as an outline. 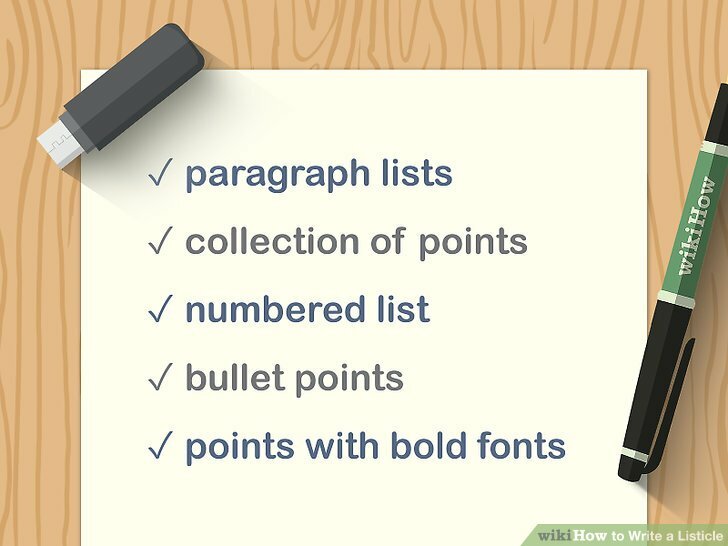 Your points should be the main ideas of your listicle, with supporting the supporting text or bullets serving as explanation. 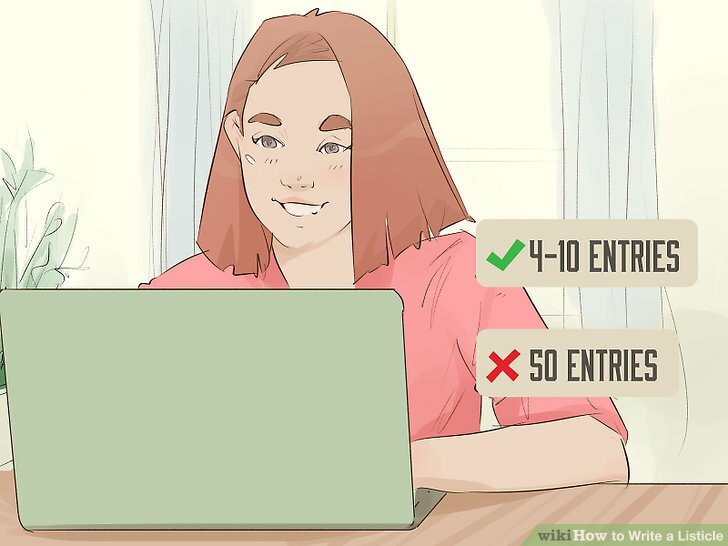 Make each entry skimmable. Your points should be concise and clear. 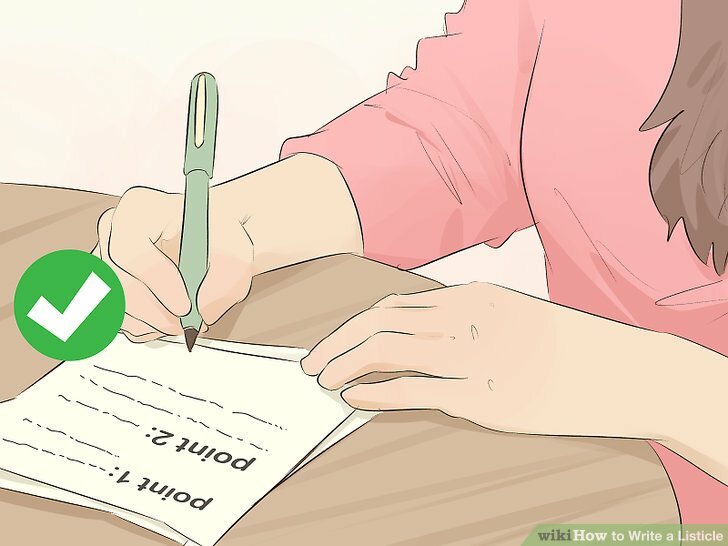 If you write text to support your points, keep your paragraphs to 3-6 sentences. 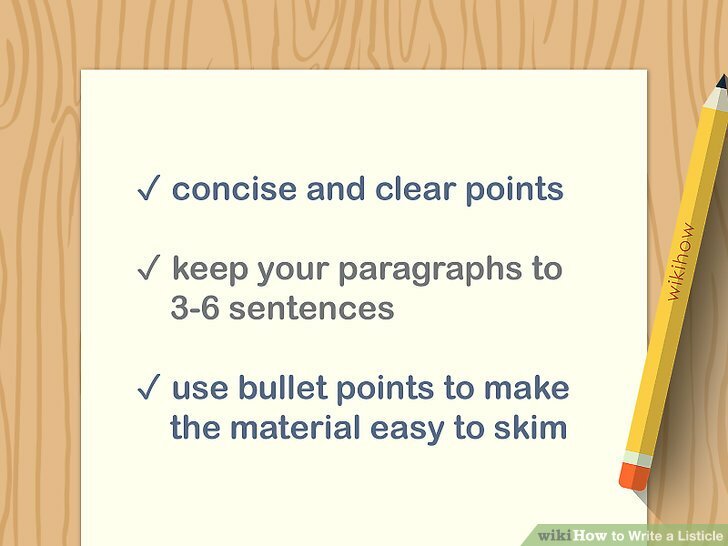 In some cases, using bullet points as part of your accompanying text can also make the material easy to skim. For example, you might summarize your explanatory text using bullet points. As an alternative, you might provide suggestions in bullets to make it easier to read. Keep your writing tight. Use as few words as possible to say what you need to say. Readers like listicles because they’re easy to quickly digest, so they don’t expect a lot of extra fluff. It’s okay if some points have more explanation than others. Don’t feel pressured to write more than you need to about a point just to make each point even. 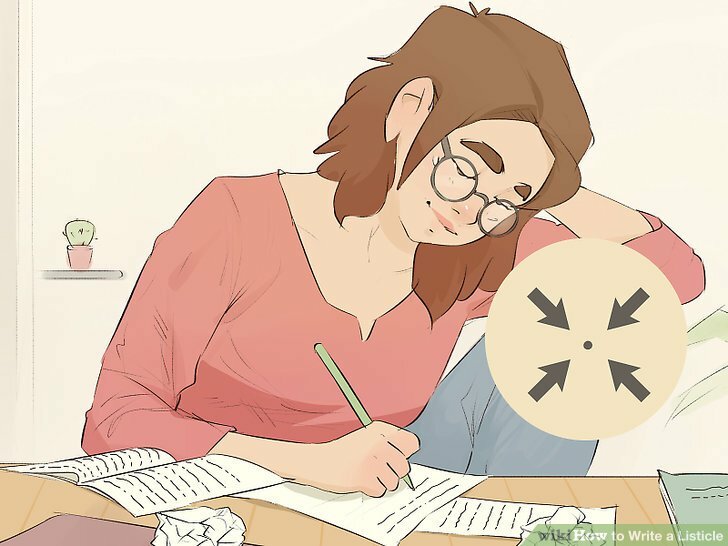 For example, a listicle written in paragraph form might include 4-10 entries, while a listicle consisting of stand alone words or sentences could include many more. Similarly, an advice listicle usually contains fewer entries so it’s useful for the reader, rather than overwhelming. Conversely, a list of fun factoids can be very long without losing the reader’s interest. Turn a serious article into a listicle to connect with more people. Listicles draw readers in because they promise a quick and easy read. Sometimes writers take advantage of that by approaching a serious issue through a listicle. You’ll want to present your ideas using 3-7 bolded points, followed by 1-3 paragraphs of text. 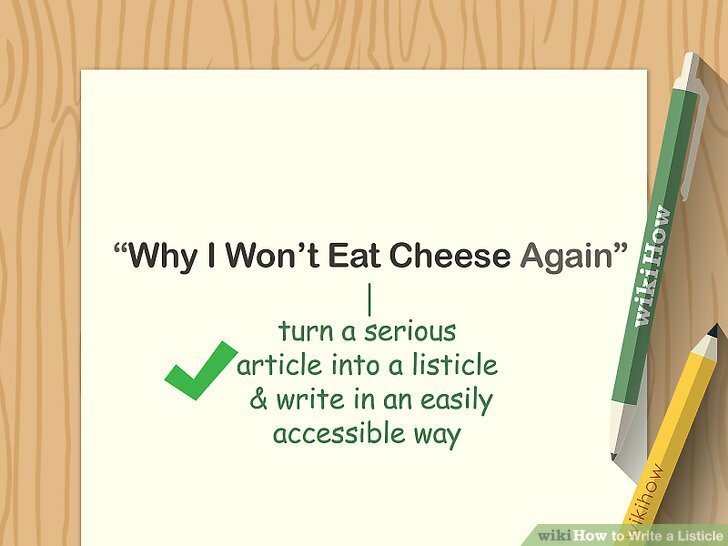 For instance, “Why I Won’t Eat Cheese Again.” This could be an exploration of the politics of animal rights, as well as how cheese is made. However, the writer can explore the topic in an easily accessible way. Entertain readers with many little factoids but little added text. Listicles can be a fun way to provide readers with a bunch of little details about your topic. While these lists can occasionally be serious, they’re often lighthearted and meant for entertainment. This is because you won’t be offering any explanatory text. Instead, just list your points. 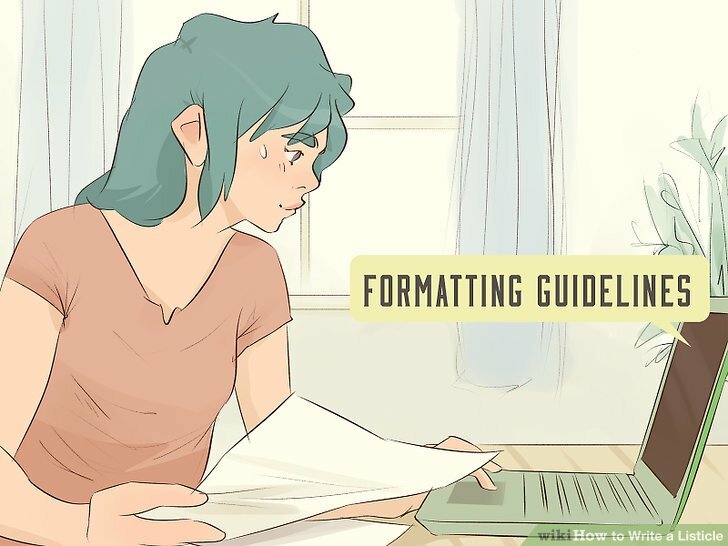 Follow formatting requirements when you're submitting for publication. Although listicles are popular across the Internet, their formatting can vary. Some sites prefer you to include more writing, while others prefer lots of images. Sites also use different software, and your file and any images will need to be compatible with it. In most cases, the formatting requirements will be available on the website you want to pitch your article to. If you don’t see this information, try searching on the Internet. As another option, you can email the editor. Try to find images and tips that really make the reader stop to think or have an “ah ha” moment. Use listicles as a way to give your readers a breather from your juicier and more original writing. Focus on keeping your content scannable. Listicles aren’t a new invention! List-based texts have been popular for a long time. Listicles aren't ideal for presenting every post or article you put up. Be thoughtful about what best serves the reader and ensures journalistic integrity. Listicles that exist to drive traffic to products or services can annoy readers, especially if the content is not worthwhile on its own. How to write PCR in SAP HCM?